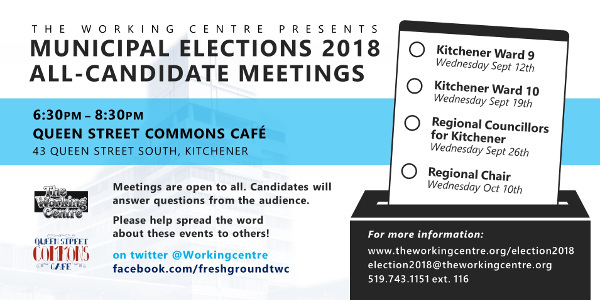 To foster voter engagement during the 2018 municipal elections, the Working Centre is hosting a series of all-candidates meetings. These meetings are open to all, and will focus on candidates answering questions from the audience. Here is the schedule of events. Note that there will be no event on October 3. We invite members of the public to participate in these sessions. In addition to the live events, we will record audio from these events and make it available on this page so that those who cannot attend the meetings can still benefit. Please join us for these sessions, and help spread the word about these events to others. For more information, email election2018@theworkingcentre.org or call Martin at 519-743-1151 x 116 . Here are some posters you can print to let others know of the events: Colour, Black and White. We also have smaller black and white leaflets you can print and distribute: Leaflets. In addition to these meetings, there are many other things going on for this election. You can find a collection of resources at https://waterlooregionvotes.org.